Naturalists' records dating back more than 100 years may be instrumental in determining the fate of the monarch butterfly in the 21st century. 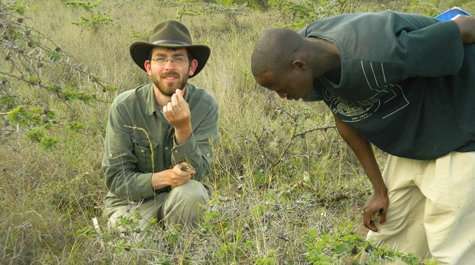 Jack Boyle, a Mellon Postdoctoral Fellow of Environmental Science and Policy at William & Mary, has been using the web to mine millions of century-old botany records to track abundance patterns of milkweed in America. His hope is to solve the puzzle of how innovations in agriculture have affected the natural habitat for monarch butterflies. Using recently digitized herbaria records to get a picture of the past, Boyle aims to predict what the future may look like for milkweed. "The source of these records are these old timey field taxonomists, who were going out and collecting specimens and then sitting in a museum and labeling them," Boyle said. "Probably, with most of these collections, no one even dreamed that this sort of research was possible." Common milkweed—or Asclepias syriaca—is best known for its symbiotic relationship with the monarch. The plant serves as the insect's primary breeding habitat. The butterflies lay eggs on milkweed, they hatch on milkweed, eat milkweed leaves and spend the next two stages of their lives on milkweed. Historically, milkweed has made its home in corn and soy fields, growing just between the rows or on the edges of farmland. "That's the disturbed environment that milkweed really likes," Boyle said. The decline in family farms in favor of industrial agriculture has dramatically changed the habitat for milkweed, Boyle says. One of the largest contributors to loss of milkweed in America has been the advent of genetically modified organisms (or GMOs) and mega crops that were designed to resist herbicides, he says. "Based on research over the last decade or two, we've grown concerned that milkweed is declining because of the use of herbicides on herbicide-resistant crops," Boyle said. "We started spraying all these fields with herbicides. The crops were fine, but it killed all the milkweed. Since milkweed is the main host plant for monarchs, this might affect how many monarch butterflies there are. So indirectly, these herbicide-resistant crops are connected to a decline in butterflies." Over the past century, changes in American agriculture have led to a fundamental shift in the nation's landscape. Crops have been engineered to resist pests and withstand weed-killing chemicals. 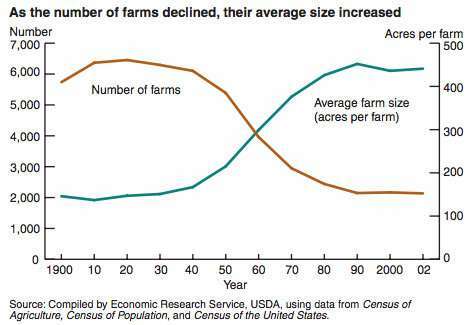 The country has seen rapid growth in average farm size, accompanied by an equally rapid decline in the number of farms. Since 1900, the number of American farms has fallen by 63 percent, while the average farm size has risen 67 percent, according to a report by the USDA. For scientists like Boyle, innovations in farming lead to larger questions. Specifically, what do changes in the natural world mean for milkweed and the monarch butterfly? Boyle has spent the better part of the past year studying milkweed with W&M biologists Harmony Dalgleish and Joshua Puzey. The results so far look grim. Boyle says he's found what looks like a "big boom" in milkweed up through 1950, but the population has been declining ever since. According to the USDA, the rapid development of inexpensive chemical fertilizers and pesticides began in the mid-1940's. Today, use of chemicals in agriculture is widespread—as crops have been genetically engineered to withstand their effects. Meanwhile, monarch butterfly populations have declined at an alarming rate. In the past 20 years, scientists estimate the iconic butterflies may have lost more than 165 million acres of habitat, which is roughly an area the size of Texas—including nearly a third of their summer breeding grounds. "The butterfly's dramatic decline has been driven in large part by the widespread planting of genetically engineered crops," read a 2017 report by the Center for Biological Diversity. "The dramatic surge in the use of Roundup and other herbicides...has virtually wiped out milkweed plants in the Midwest's corn and soybean fields." While Boyle agrees that herbicides have played a major role in reducing milkweed populations, his research points to other factors that may be just as important. In particular, the shift from small farms to large-scale cash crops. "During the period when milkweed was increasing, there was an increase in the amount of farmland being used across the United States," Boyle said. "That factor is pretty important when it comes to understanding how many milkweeds there are now—and, in turn, how many monarchs we might expect if humans weren't busy taking all of these once prairies and turning them into big monocultures." Boyle says. While industrial farming in the U.S. has primarily relied on the consolidation of small farms, other parts of the world are using GMOs to grow crops in entirely new climates. For example, Mozambique planted its first confined GMO field trial for drought resistant corn in February 2017. "While that may be considered a bad thing, at least from a strictly conservation standpoint, it brings in a whole bunch of other questions," Boyle said. "Like, how do you weigh keeping people from starving versus species and habitat conservation?" These are just the type of ethical questions Boyle plans to pose to undergraduate students in a new course this spring titled "Promises and Perils of Biotechnology for Conservation." "In the case of GMOs, a lot of what we're going to be talking about are the actual impacts of GMOs on agriculture," Boyle said. "How they have changed agricultural practices and how it has affected the wild landscapes that are nearby—or aren't existing anymore because now they are crops." Other topics he plans to touch on are de-extinction, such as the ethics of bringing back the wooly mammoth, and planned termination, such as altering the genes of malaria-carrying mosquitoes to spur their extinction. "The question of what we value is pretty important," Boyle said. "A lot of people would say that species have an intrinsic value of their own. If that's the case, then that's a pretty high cost in driving a species extinct. It would have to do a lot of good before you're even considering doing some of these sorts of things."